I"m in Brampton, Ontario. 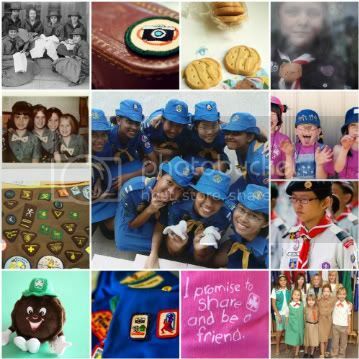 I used to be in Girl Guides and Brownies :) I sold all my badges on ebay a few years back thinking I might get a buck or two....who KNEW! I made a pretty penny. People are really into collecting these! I have an old picture of me and my sisters in our Girl Scout uniforms. It was taken at home before leaving for a Father/Daughter dinner. I think it is already on my computer, so if I can find it I will upload it. (I am cityclickernet on flickr). I also have some of my old Girl Scout thingies that I am planning to show on Vintage Thingies Thursday when I get around to gathering it all up from multiple hiding places. Nice and cute blog, have a nice day. @ Casa da poesia, what a beautiful greeting, "sangham saranan gacchami" to you too! @ SsstSonia, thank you very much. Many thanks to you each for your comments, I really appreciate them all!